I watched a scene play out in Pets at Home the other day. A large lady had what was little more than a puppy on the end of a lead. A male shop assistant approached then bent over with hand outstretched to say hello, whereupon the little dog flew at him, snapping and snarling. The woman quickly picked the dog up and smacked him – hard – whilst also apologising to the man. On the floor was a puddle of wee. This is wrong on so many counts. The man, working in a pet shop, should have known not to approach a dog in this way. The woman, knowing her dog, should have protected him. The dog was so scared he urinated and it’s a proven fact that punishing fear only makes fear worse. Punishing makes the punisher feel better. Finally, not that I condone the punishment in any way at all, if it were to have any affect it would need to exactly coincide with the ‘crime’ – not afterwards. This little dog was being hit, in his mind, out of the blue when he was already really scared by the very person whom he should be able to trust the most and who had let him down. Victoria Stilwell writes in an article, ‘The Science Says, Don’t Hit the Dog‘: ‘The term “discipline” is thrown around loosely in the dog training world. You’ll find all kinds of opinions about when and how to discipline a dog, but how do you know what to believe?’ She says scientific research shows just how damaging certain methods of discipline can be to your dog. Researchers have been studying dog behavior and cognition for decades with one important study as long ago as the 1960’s. Studies showed that unless you are able to catch a dog actually in the act, it’s unlikely that he will make the connection that he’s done something ‘wrong’. It then undermines your relationship with the dog because your unpredictable behaviour will only reduce his trust in you and cause him to fear you. This is the million-dollar queston – is punishment necessary at all? (Technically we can talk about ‘quadrants’, positive and negative punishment and so on, but I use the word ‘punishment’ here in the way a lay person would). ‘What many dog owners don’t realize is that when they physically punish or intimidate a dog for an undesired behavior’, says Stilwell, ‘although in the moment it may seem like the behavior has stopped, they are actually opening the floodgates for fear and aggression’. She finishes, ‘Positive training doesn’t mean permissive training that allows the dog to get away with bad behaviors, but it’s rather a more humane way to help your dog learn, think, and cope in our domestic world. If we can trade in the long-outdated view that our dogs need to be dominated into submission, we’re going to see a drastic drop in aggression and bites from our four-legged companions’. Stanley Coren lists methods of punishment we humans use on our dogs in order to ‘cure’ problems by using force in Psychology Today. ‘Common punishing or confrontational techniques used to control dogs include: sharp leash corrections meant to cause discomfort; hitting or kicking the dog; applying electric shock; applying physical force to pressure a dog into a submissive down position; or the “alpha roll,” which forces the dog on its back in an apparently submissive position, plus a variety of other techniques involving shouting, threatening stares or growls, use of water sprays or water guns, grabbing the dog by the scruff of the neck or the jowls and shaking it, and similar procedures’. With this in mind, he looked at a recent study in the journal Pediatrics which dealt with human children, not dogs, and the effects of spanking. Based on data from nearly 2,500 children, Catherine Taylor at Tulane University reports that the odds of a child being more aggressive at age 5 increased by 50 percent if he had been spanked more than twice in the month before they did the test (it’s hard to imagine how they conducted this test but I’ve not looked into that). Spanking is a form of punishment that becomes less effective with repeated use and also makes discipline more difficult as the child outgrows it. Coren quotes Meghan Herron at the University of Pennsylvania who reported in the journal Applied Animal Behavior Science that using punishing techniques when training dogs tends to increase the aggression in the animals, in much the same way that spanking increases aggressive responses in human children. Just how aggressively dogs responded depended upon harshness of the technique used to force or punish the dog. Quote: ’43 percent of the dogs increased their aggression in response to being hit or kicked, while only 3 percent showed an increase in aggression associated in response to a corrective sound such as “Schhtt!” or “Uh-Uh!” ‘. The poor little dog I saw in Pets at Home doesn’t, unfortunately, stand a chance unless his human gets some help in changing her ways. Like too many people she is, in her ignorance, creating an aggressive dog. 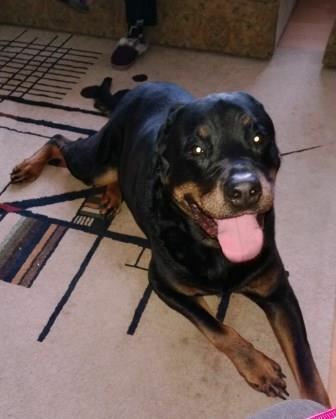 Here is the story of a young Rottie I worked with a while ago whose new owner had inherited the fallout from punishment and dominance techniques previously used. This entry was posted in behaviour, PAWS for Thought and tagged discipline, dog abuse, dog hitting, dog punishment, hitting your dog, positive vs. punitive training, punishment, smack, smacking, Victoria Stilwell. Bookmark the permalink. 1 Response to Hit the dog? Why? Magic is my second Border collie. I find the breed fascinating with their beauty, intelligence, and intuition. Magic does SO WELL with just a quiet, noooo. Quick learner, so eager to please.